EXCLUSIVE: Paramount has made a preemptive film rights deal for Avengelyne, with Akiva Goldsman producing with an eye toward directing a thriller revolving around a heroine hatched by Deadpool creator Rob Liefeld. Goldsman, who is currently overseeing the Hasbro movies for Paramount after overseeing the Transformers writer room for the studio, will head the search for a screenwriter to draft a movie that is being called John Wick with a fallen angel. Deal was mid against high six figures for the rights. Avengelyne is an angel who fights the forces of evil and often finds herself face-to-face with demons and monsters. She was the most feared warrior in Heaven’s Warhost, having single-handedly broken into Pandemonium, the outer fortress of Hell, to confront the Devil himself. She is a fallen angel, banished from Heaven by God after being tricked into questioning his love for humans. 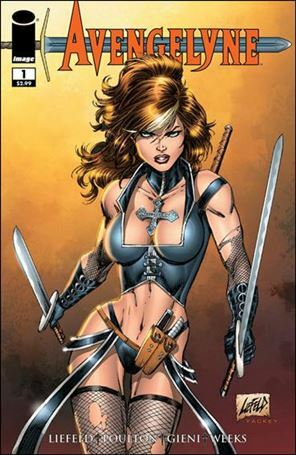 Avengelyne was stripped of all her angelic abilities, other than her great strength and her blood, which, once extracted from her body, could be used as a weapon or a miracle once empowered by quoting verses from the Bible. Avengelyne uses her powers to fight demons on earth and is being groomed to be humankind’s last hope in a coming Armageddon. Liefeld several years ago said he would write the movie as a vehicle for fighter-turned-action star Gina Carano. At the time, he explained Avengelyne’s appeal: “Avengelyne resonated so powerfully with the audience because her story of redemption is one that is so relatable. A fallen angel, sentenced to redeem herself by serving humanity, Earth is a foreign environment to her, she must adapt in order to save herself as well as mankind. Her dilemma provides humor amidst the larger plot engine driving her journey. ” There is no actress in line for the role at the moment.